Densmore's thinking about the people she studied might seem contradictory today. Letters reveal her thoughts about working with Indians and Indian character. IN MANY WAYS, Frances Densmore's attitude towards the people she studied was typical for a 19th Century Christian woman. By today's standards, the things she said about Indians were often condescending or sound racist. Yet Densmore devoted her life to preserving what few white Americans cared about: Native American music. Whites might be captivated by war bonnets and woodland lore, but Indian music seemed strange, ugly and impenetrable. In her early years, Densmore believed that music of the plains Indians was "representative of all American Indians. "14 That view grew more sophisticated over time as she recognized the diversity of Indian cultures. Meanwhile, her private opinion of Indian character slid down an opposite course. Densmore's early, romantic idealization of Native people ended in a sort of bitter resentment. Before she ever met many Indians, Densmore portrayed them to her lecture audiences in gaudy, sunset colors. Pushed along by civilization, elbowed and jostled, he who stalked the prairie and knew the land from one horizon to the other belonged to him and his own people (now) finds his little farm and cornfield taken away from him again and again. He holds his head high and walks with the old dignity, but the barbed arrow is in his heart. The white man has no time to sit by the fire, smoke the long pipe and exchange grave compliments with his dark brother. 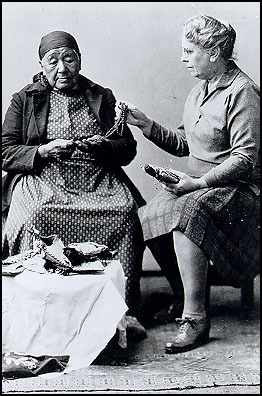 But after nearly four decades of field work among Indians, Densmore seemed bitter that "her" Indians never compliantly dissolved into America's melting pot. That was always her wish. Many ethnologists of her era thought Indian culture would-and should-get trampled in the American march of progress.